Hello my dear crafty friends and welcome to my post made for Rebecca Baer with two cards as my inspiration for you. 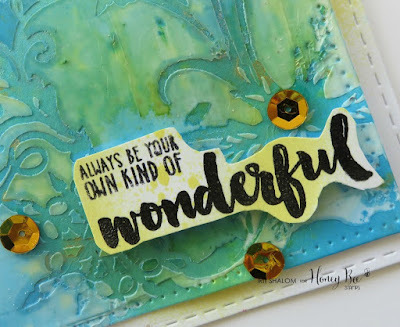 On my first card I used Rebecca Baer snowflakes background and add this " your own kind of wonderful " sentiment. 1. Use texture paste over the Rebecca Baer small sized Snow Flurries stencil. This size of stencil is just perfect for the cards. Let the paste dry. The second card was made to show you how the very same Rebecca Baer stencil can look so different when you use another colors of mists and make it more pastel. So I made the background in the same way with the very same Snow Flurries small sized stencil and the very same texture paste. Then I just misted with two Tattered Angels mists and the background was all done. Stamped image and a sentiment (Two Paper Divas) were colored, hand cut and glued over the card.